We are one of the most steadfast and trusted companies which are broadly engaged in providing Refrigerated Transportation Services. The incomparable transportation services offered by us are broadly cherished for their reliable approach. 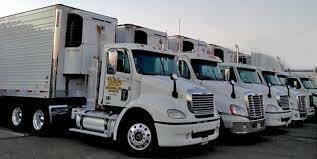 Furthermore, we take responsibility to transport expensive or perishable goods from one to other place safely. These are widely appreciated for reliability, timely delivery of the products and assured safety of products. Designed in compliance with international quality standards, our chiller trucks are widely used for transporting perishable products at low temperature. Our truck refrigeration is CFC free and microprocessor controlled system, that has attained appreciation for longer service life. Incepted in the year 2007, Saumya Road Carriers is amid one of the notable business enterprises engaged in the arena of presenting to our patrons a huge consignment of Transport Contracting Services, Full and Part Load Transportation Service, Loading and Unloading Service, Relocation Services, Manpower Supply Service, Fleet Services, Car Carrier Service, Shifting Service. These services are delivered under the supervision of nimble personnel to retain their superiority. To add, these services are extensively appreciated and commended due to their flexibility, reliability and exactness. By providing these services to the patrons aptly, we are capable of preserving long-term relations with them.